British Museum Publications, 1983. Hardcover, 199 pages, 40 plates. Very Fine condition. The Cunetio Hoard is the largest hoard of Roman coins found in Britain. It was discovered in 1978 at the site of the Roman town of Cunetio, near modern-day Mildenhall, Wiltshire, and consisted of 54,951 coins. The hoard was gathered and buried during the years AD 260-275, a period of political and monetary crisis for the Roman Empire. It includes representative cross-section of the coinage of 250-270 but nearly half the hoards comes from the independent empire established in Gaul by Postumus in 260. Important and very rare book. It took us more than 10 years to obtain a copy for our library, this is first copy we have ever had for sale. Ex. Bruce R. Brace library with his Ex Libris bookplate. 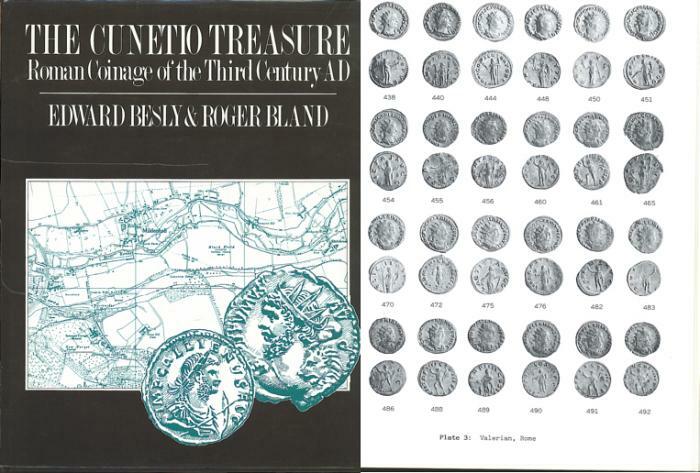 Bruce Brace was a scholar and by many considered to be a dean of Roman Numismatics in Canada. Coins from his extensive collection were sold by CNG in 2012 and 2013.